One commonly noted side effect of growing older is the sense that time is speeding up. I don’t suppose anyone knows for sure why this happens, but I think that the tendency to fall into routines has something to do with it. When days all follow the same pattern, they blend together and zip right by. I think that this year I have discovered the secret to making time slow down again. It was only 13 months ago that we landed in Damascus, yet so much has happened that it feels at least five years must have passed. We’ve set up homes on three continents, traveled in 12 countries, visited the US twice, and taught at three different schools (plus a virtual one). Our kitchen has burned up, we’ve been evacuated from a civil war, our lights have gone out. Our bank account has been frozen. We’ve fallen off horses. We’ve been soaked by monsoons. We’ve been patted down by secret police. On the other hand, we’ve seen beautiful places we never knew existed: ruins in Petra, waterfalls in Bosnia, cobbled alleys in Dubrovnik, caves in Lebanon, meadows in the Ethiopian highlands. We’ve ridden camels (I like camels). We’ve met wonderful, helpful, generous people in unexpected places. We’ve consumed burek, steak tartare, doro wat, haggis, kibbeh, goulash and dumplings, barbecued goat ribs, and more tiny cups of coffee than I care to count. We’ve been busy. And no two days have been the same. There is a downside to the time lord lifestyle. Even if you have great companions, you miss your family and friends back home. But we’ll meet again. Unless the angels get the phone box. If you don’t know what I’m talking about, you’re not watching enough Doctor Who. 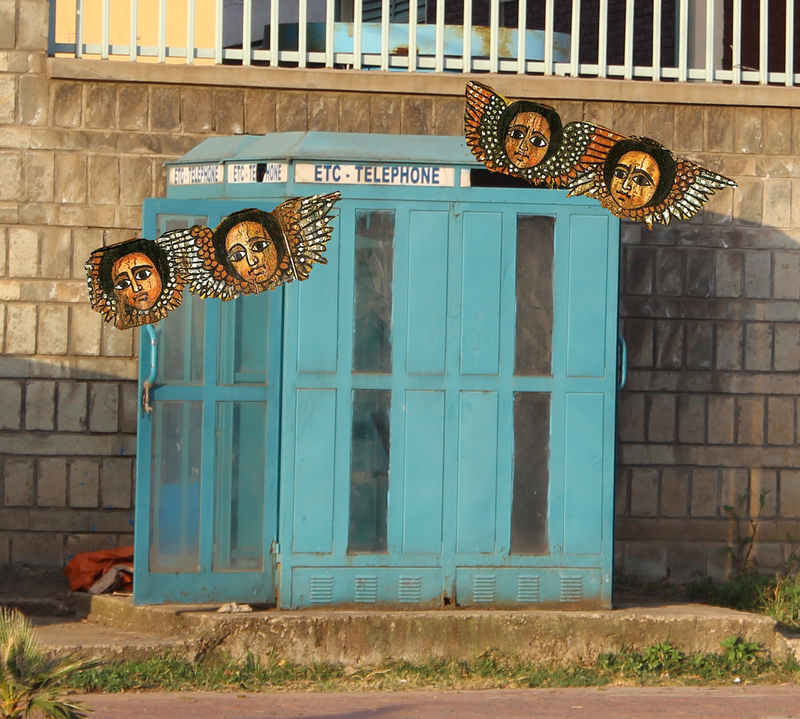 This entry was posted in Addis Ababa, Elsewhere, Expat experience and tagged Doctor Who. Bookmark the permalink. When I retire, I want to become a Time Lord. You need to send that picture to BBC Cymru just in case they’re considering giving the Tardis a make-over. So very true. This vividness and richness of new experience is the most valuable thing about teaching overseas. Plus, you’ll make new and forever friends at a rate you hadn’t since college!